It’s been a while since I did a “Pin & Spin” blog, which is where you find something you love on Pinterest and do your own take on it (in other words, you don’t follow the recipe but we’re going to say it nicer than that!). John discovered this Squash Croquette recipe and we just loved it. Yes, it’s fried but if you use olive oil it’s still quite tasty and pretty healthy (it’s pan fried, not deep fat fried). 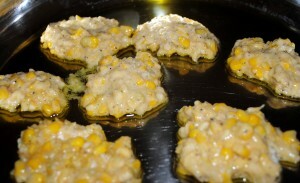 We started discussing how we wanted to change the recipe just for fun and decided it would be delicious with corn. 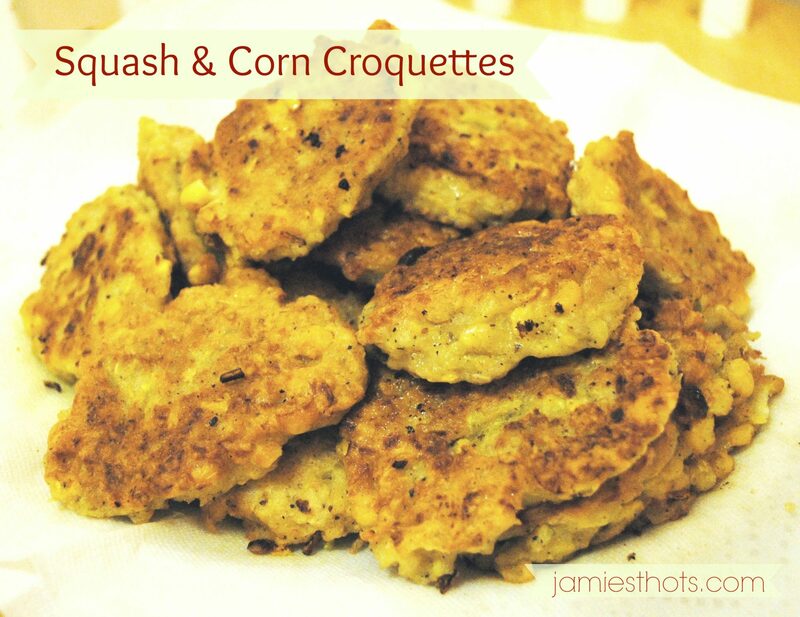 So, I figured out how to make these croquettes with corn, squash and onion. There was a bit of trial and error, but the final result was just as delicious! Definitely different, but still amazing. Before I share the recipe, I have to share a story. As most of you have noticed, I’ve tried to step up the game so to speak with my photography. I have a new-to-me DSLR and have having a blast learning to use it. When I do a recipe, I try to get a photo of all the ingredients together. This is a common blogging trend but also helpful so readers can see what some of the food looks like (especially helpful for those ingredients that might be new to the reader). So I had my ingredients pretty well gathered and realized I forgot my camera so I went in the other room to get it. I should also point out that I shoot most of these pictures outside because the natural light is always easier to work with. 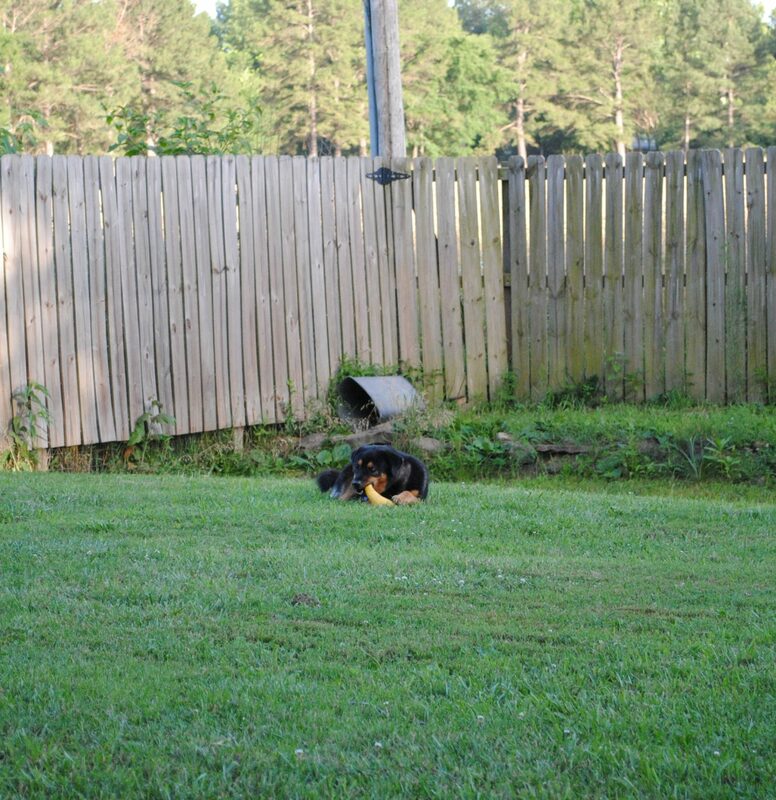 It’s taken from a distance because Flower wouldn’t let me get any closer to reclaim the squash she stole! 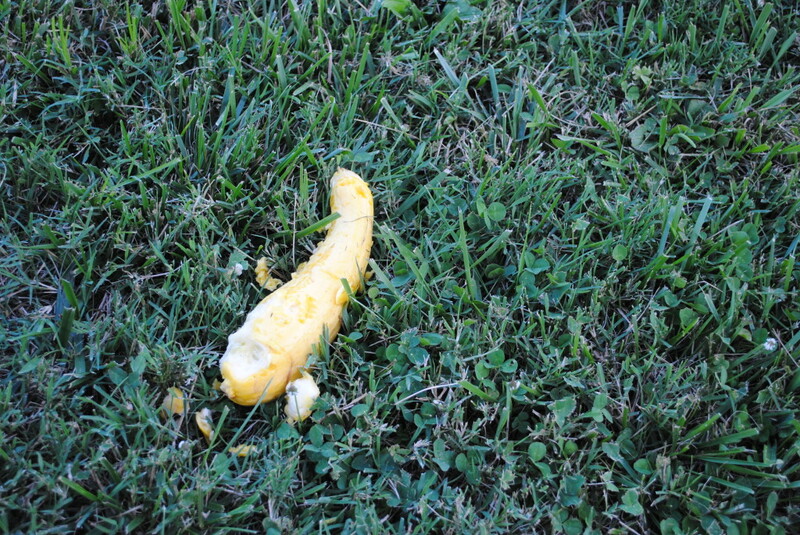 I tried to get her then our other dog to bring back the squash (no, I wasn’t going to use it). Apparently we’ve never taught the command “Get the squash” so I finally went out in the yard and retrieved the vegetable myself. Yuck, Flower. Yuck. We won’t be using this squash in the croquettes! So, after throwing away the bad squash I got another, smaller one out of the fridge. Fortunately we had two small ones left from the Farm Fresh department at our local Harp’s (a section filled with fresh produce from local farmers). Later that night, I started experimenting with the croquettes and this represents what I finally came up with. 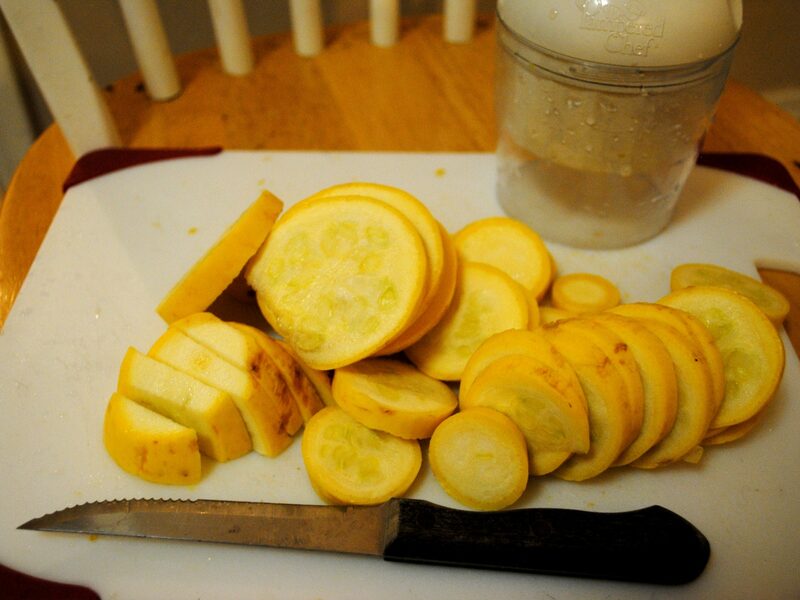 It’s easier to slice the squash first then use a chopper to chop it up. I know, I know. These look gross. But I wanted to show what they look like when fresh in the oil so you get an idea for the size. 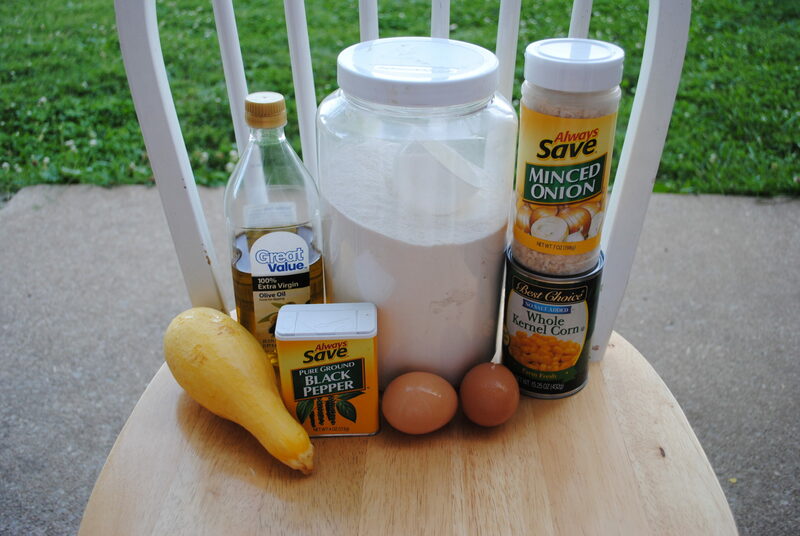 I’ll have to give this a try after having sworn off yellow squash for awhile. I love mixing in veggies to get more nutrition and variety. Great idea!